“The first settler to come to the Colfax area was Ole Running, after whom Running Valley is named. He came together with Gunder Kinney in the summer of 1862. Running, who had his family with him settled for good, but Gunder Kinney went back to Crawford County, returning the following summer with his family to settle permanently”. The above is an introduction to the memorial book of the Holden Evangelical Lutheran congregation, 1864-1914. 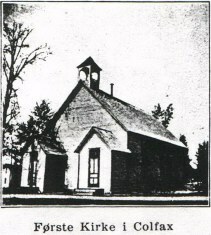 This congregation, near the town Colfax, is in Dunn County in the west of Wisconsin. In Martin Ulvestad's book Nordmændene i Amerika it says that Ole Running was a native of Skien and Gunder Kinney from Telemark. “Eighteen Mile Creek” was the congregation's first name, and was dedicated on 24th January 1864. One of those who signed the first congregation's ordnances was Gundar Christensen Opsal from Valebø (Holla 1, page 786). Two of his brothers, Nils and Jon had emigrated in 1843 and 1844, whilst Gundar went in 1846. These brothers had been in Heart Prairie also and Gunder got married there in 1852. Nils changed his name to Nelson Kinney. In 1860 the brothers moved westwards in Wisconsin to Crawford County and from there Gundar moved with his family northwards to Eighteen Mile Creek. Today's priest, Gary Garnatz writes in a letter that none of the older members of the congregation remember the Kinney family, but some of them remember hearing about the Kinney School in Running Valley. This was right next to the house where Gunder Kinney lived. Gunder and wife Thone had nine children, of whom at least three grew up to adulthood. Ole Gunder, one of the sons, was also one of the three authors of the memorial book in 1914, and he must have known why the congregation was named Holden. In the meantime Kinney's descendants moved away from the area. 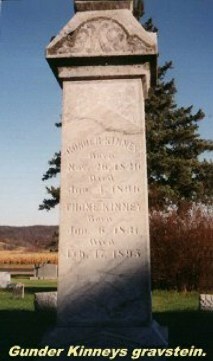 Ole G Kinney was voted onto Wisconsin's Senate but died on Christmas Day 1921, before he had chance to take the seat. At the next anniversary in 1939 there wasn't anybody left who knew the origin of the congregation's name. In the anniversary publication of that year it states: “At a meeting on 21st January 1867 it was decided to use the name Holden. It would be interesting to know why this name was chosen, but the historical records give no explanation for this”. In the church records it says only that the congregation wanted a new name and that Holden was picked from many alternatives. 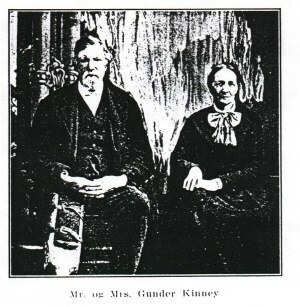 Gunder Kinney was an active member of the congregation and it can be said with reasonable certainty that it was he who suggested the name. This was the fourth congregation that took its name from our town! 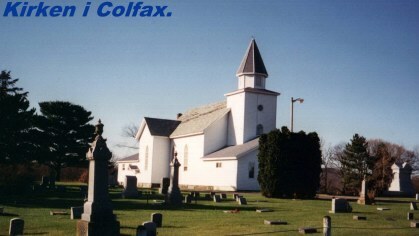 The congregation has grown over the years and it's official name is Colfax Rural Lutheran Parish of the Evangelical Lutheran Church in America and is an active church which today owns three churches: Holden, Colfax and Norton. Holden church, which is the oldest, celebrated it's centenary in 1978. In the northeast corner of the churchyard stands an impressive tombstone over the grave of Gundar Christensen Oppsal and his wife Thone. 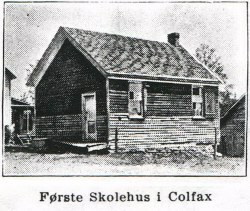 He was born in 1826 and baptised in Romnes church near Ulefoss. He was buried in 1896. His wife, one of his sons and wife together with a grandchild now lie alongside. There is little evidence today that there are people in the congregation who have roots going back to our Holden, but once again the name was planted in the New World.